Due to the high ROI and targeted approach, email marketing remains one of the most effective marketing strategies available. MailChimp is one of the most popular and powerful email marketing tools online, so you’ll be glad to hear that it is one of the fundamental integrations on the SkyStats dashboard. The MailChimp dashboard integration is the perfect tool for businesses and individuals who want to stay on top of email campaigns and make the most of email marketing strategies. 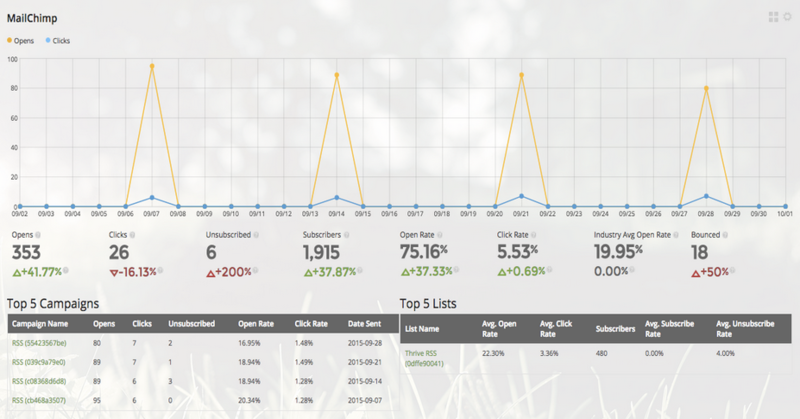 Dashboard Graph: clicks, subscribers, open rate, click rate, etc. Details Page: opens, unsubscriptions, open rates, bounce rates, etc. Detail Page Top 5 Campaigns: opens, click rates, dates sent, etc. Detail Page Top 5 Subscriber Lists: average subscription and unsubscription rates, etc. Enjoy viewing your email marketing data and tracking your campaigns using the beautiful interface and intuitive design of SkyStats. Make the most of email campaigns! Data Usage Policy: Authenticating the SkyStats WordPress Dashboard Plugin grants the widget access to your individual MailChimp account data. Once installed, your SkyStats’ MailChimp data will never be shared with any third party unless you grant access from the in-page widget. Also, SkyStats authenticates using Auth 2.0 method and saves the Access Token in the database to fetch the user’s Statistics. The file system that runs on your WordPress installation may cache some data locally. You may disable or purge all authentication and cache data from the plugin using the “Deauthorize” button at any time.